Dave and I have been together for 15 years now, so as you can imagine, we’ve shared many bizarre convention adventures, given the sheer number of shows we’ve done. However, there’s one small, local convention that still wins for the most bizarre. Being there, I felt like I was floating through this weird, drug-induced pop culture dream, filled with disparate TV and film characters from my youth and early adulthood. It was a small collectors’ show at a suburban Chicago Holiday Inn, held in this cramped, low-ceilinged, poorly lit conference room. The moment I walked in, I was met by actor Richard Kiel (Jaws from James Bond—SQUEE!–and hilarious in Happy Gilmore) joined by his lovely wife. At this point, Richard was already having health issues, confined to getting around in a Rascal, which broke my heart a little. 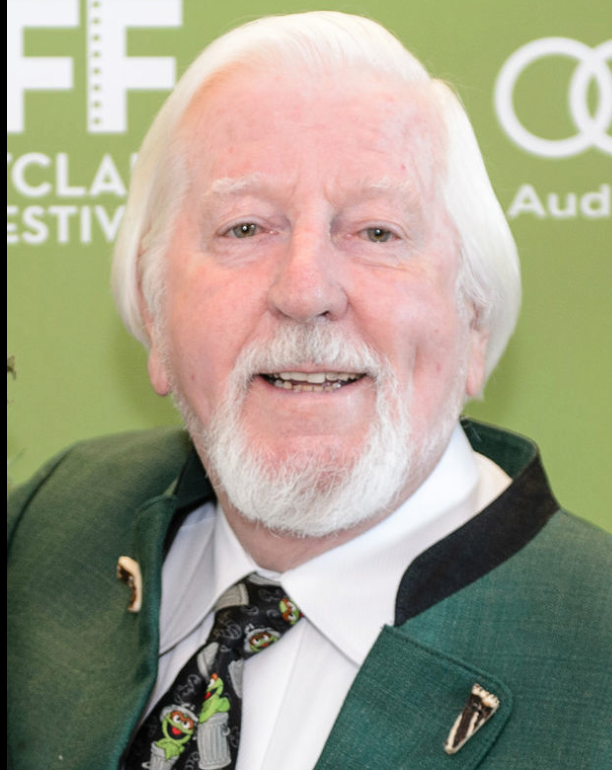 He was a gentle giant and a sweet soul, very kind to the fans. 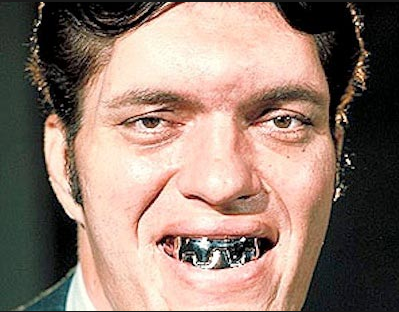 Further down the line of tables on the same side as Richard Kiel was the elegant Goldfinger actress Shirley Eaton, who was with one of her sons hawking books of her own poetry and autographing pictures of her gold-painted Bond Girl character, Jill Masterson. That was one tzotchke I had to have, although I gifted it to a kindred James Bond fan later that evening for his birthday. (Side note: Those exotic James Bond films were a VERY. BIG. DEAL. at my house growing up. About once every February a James Bond flick was ABC’s Movie of the Week, my TV viewing highlight of the year). Actress Shirley Eaton was still beautiful in her 70s when I met her. 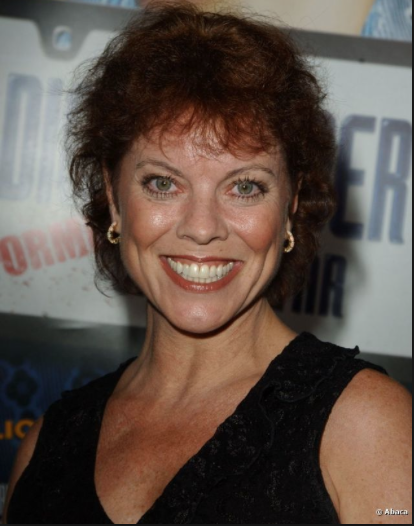 Shortly past Shirley, and directly across from Dave Dorman was actress Erin Moran of Happy Days fame. You might be surprised to know that petite little Erin has this husky, whiskey-and-cigarettes tone of voice that really carries…the sort of voice that literally exhausts Dave and vexes his spirit. The gregarious sort, Erin’s voice was a loud, constant drone throughout the show. Dave couldn’t escape it, penned to his table, enduring 8 hours of it on Saturday. He actually shortened his exhibit hours on Sunday, as he could no longer bear the sound of her. Erin was great to her fans, but Dave was not one of them. 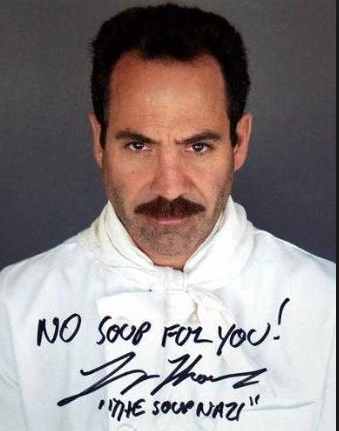 and actor Larry Thomas, The Soup Nazi from Seinfeld. When my cousin Becky and I watched “Dazed and Confused,” we both felt as if we’d been partying all night just from watching it…it left us with this strange, hung-over feeling. And that’s how I felt after 8 hours at this collectors’ show with the most eclectic mash-up of TV and film figures from my lifetime. I still have the occasional dream–I’m the weirdo who remembers my dreams every morning–where I’m floating through that Holiday Inn pop culture blur…Dazed and Confused.